ROOKiEZ is PUNK'D, the four-piece band based in Shibuya exploded onto the music scene in June 2010 with their very first single, "Complication." The single quickly reached number one in downloadable tracks, ranked 11th on the Oricon Weekly ranking, and was featured as the opening theme for the animated series Durarara!! ROOKiEZ is PUNK'D went on to have songs featured in the anime series Bleach with "song for…" and "IN MY WORLD," the second opening theme for Ao no Exorcist. In 2011 the band collaborated with the creators of Durarara!! to release their first album "DRRROOKiEZ!! 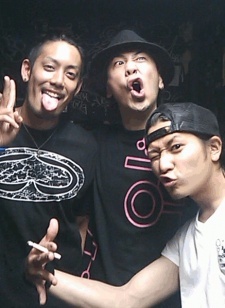 – ROOKiEZ is PUNK'D respect for DRRR!!" featuring "DROP," the opening theme for the PSP game Durarara!! 3-way Standoff. ROOKiEZ is PUNK'D attracts Rock and J-Pop fans through their unique sound which includes Rock, Punk, and Emo. They have performed for their fans over 100 times in a single year and every time, the audience was hungry for more. The band's influence has also expanded to fashion with collaborations with SRH Clothing in San Diego and Shibuya-based Subciety. They are signed under defSTAR records, a sub-label of Sony Music Japan. In my world is the best for me!!!!! all their songs except song for are top 50-top 5 material.